BerGenBio’s bemcentinib already has broad commercial potential in various cancer settings, and now new preclinical data shows that this compound (or the Axl monoclonal antibody BGB149) could be used to treat fibrosis. There are limited treatments available in this therapeutic field, and the data suggests that inhibiting Axl could reduce fibrosis. BerGenBio is yet to announce any development plans in fibrosis. The company has recently raised NOK187m ($24m) in a private placement and is now well positioned to start such a programme. 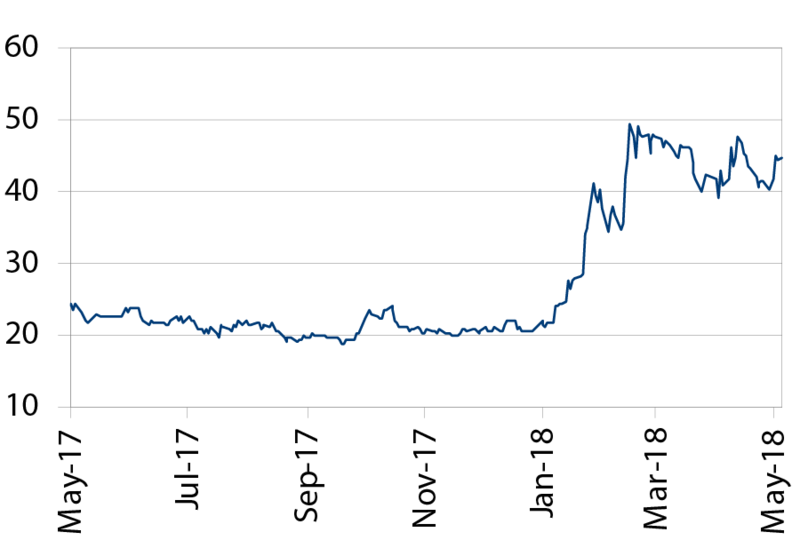 We raise our valuation to NOK2,880m (NOK52.65/share), which, in line with our conservative approach, excludes the potential of bemcentinib/ BGB149 in fibrosis. Axl plays several key roles in fibrosis Fibrosis is a disease that affects all tissues where the healing process goes awry causing excessive scar tissue to be produced, and is often associated with impaired organ function. For example, idiopathic pulmonary fibrosis (IPF) causes lung tissue to lose its elasticity and patients have a life expectancy of less than five years. New data further demonstrates that inhibiting Axl can disturb the progression of the disease via different mechanisms and reduce fibrosis in IPF and liver fibrosis in preclinical models. Two options for BerGenBio in fibrosis BerGenBio has not yet disclosed any development plans in fibrosis. It could target both bemcentinib (selective oral Axl inhibitor) and BGB149 (Axl monoclonal antibody) at fibrotic diseases. The decision will depend on scientific considerations, time-to-market and pricing conditions. BerGenBio raised NOK187.5m in a private placement in April, and now has the financial strength to expand its pipeline into fibrosis. Interim data from six Phase II trials due at ASCO There are currently six Phase II trials underway and interim data from all of them are expected to be presented during the ASCO meeting on 1-5 June. The most eagerly anticipated is the first efficacy data from the three immuno-oncology trials in non-small cell lung cancer, triple negative breast cancer and melanoma in combination with Merck’s Keytruda. Promising data from these trials could lead to a significant re-rating of the shares. Valuation is raised to NOK52.65/share We have increased our valuation by NOK361m to NOK2,880m ($339m, NOK52.65 per share) following the NOK187.5m capital raise and after updating our financial model. In line with our conservative valuation approach, this currently excludes any potential valuation of bemcentinib/BGB149 in fibrosis, as BerGenBio is yet to disclose any plans in this therapeutic field. BerGenBio is an expert in the biology of Axl, and its lead product, bemcentinib, is the most advanced specific oral Axl inhibitor in clinical development. So far, the company has been focussed on the potential of Axl inhibition in oncology, and this remains unchanged, but new preclinical data highlights further potential and opens up new opportunities for the company in the field of fibrosis. Fibrosis occurs when a normal healing process goes awry, and excessive amounts of scarring forms. A clear example of this is with the formation of keloid scars, in which scar tissue develops beyond the original boundaries of the wound, creating unsightly and often painful scarring. Fibrosis can occur in most tissues, severely impairing the function of the affected organ. In some cases it is associated with a particularly poor prognosis, such as with idiopathic pulmonary fibrosis (IPF) where life expectancy is less than five years. Although some forms of fibrosis are quite common, 2.8% of adults over 40 years old suffer from liver fibrosis and c 10% of people suffer from renal fibrosis (often associated with diabetes and chronic kidney disease), there are very limited treatment options. Many are treated with ACE inhibitors to reduce a person’s blood pressure to help manage the decline caused by the fibrosis. Two new therapies, Roche’s pirfenidone (Esbriet) and Boehringer Ingelheim’s nintedanib (Ofev), were approved in 2014 for the treatment of IPF, but these are associated with severe adverse events, and, while they improve lung functions, they have a limited impact on all-cause mortality. The fibroblasts also secrete TGFβ and other cytokines that promote the chronic, pro-fibrotic inflammation state, thereby setting up a positive feedback loop, which leads to excessive levels of ECM proteins being secreted and fibrosis. During the disease progression, the response of the immune system plays a key role. During normal healing, the response becomes proinflammatory (Th1-mediated) whereas in fibrosis, the response is chronic and profibrotic (Th2- and Th17-medicated, Exhibit 1). Interestingly, M2 macrophages, which are found in fibrotic tissue, also have a tumour-promoting activity and are associated with aggressive cancers. The presence of fibroblasts and myofibroblasts are clearly crucial in the development of fibrosis as they cause the excessive production of ECM in fibrosis. However, the precise origin of these cells is currently unknown, and could vary depending on the tissue. It was thought that epithelial-mesenchymal transition (EMT) was the main source of the fibroblasts, but more recent experiments have thrown some doubt on this, and other hypotheses suggest they originate from local fibroblasts or mesenchymal cells, or from circulating bone marrow-derived progenitor cells. The Axl receptor has limited activity in normal tissues but can have far reaching effects on the immune system and other cells, including playing an important role in EMT. To date, drug development activities targeting Axl, including BerGenBio’s have focussed on oncology largely because the receptor is expressed at high levels by various tumours. But, as the understanding of Axl biology improves, it is now recognised that an Axl inhibitor could have most activity in cancer as an immuno-oncology agent. In a similar way, Axl has become a promising target for the treatment of fibrosis, and Axl inhibitors have the potential to block the disease process at various stages. Inhibition of the Axl receptor can block the initial stage of the process. Data recently published in a poster by Tutusaus et al at the EASL conference in April 2018 provided further evidence that inhibiting Axl with bemcentinib prevents the activation of hepatic stellar cells in liver fibrosis models, and in doing so, reduces liver fibrosis and hepatic inflammation. 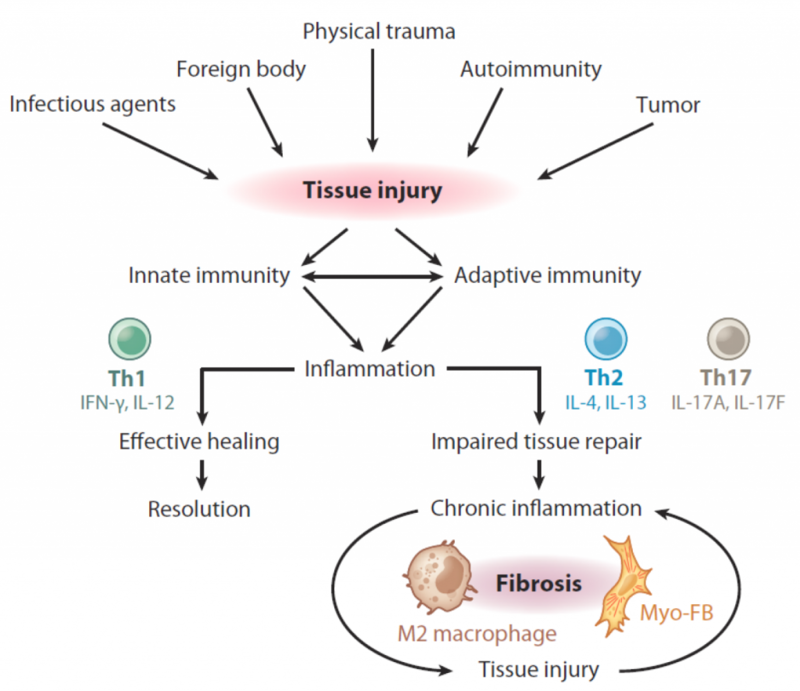 The immune response in both aggressive tumours and fibrotic tissues is similar, as mentioned above, with a Th2-mediated chronic inflammation developing. It has been shown in various preclinical studies for solid tumours that Axl signalling promotes a Th2 response in tumours via the STAT1 pathway (see Initiation note dated 4 January) which inhibits the production of Interferon-γ. Conversely, inhibition of Axl signalling results in a Th1 response being triggered. A similar observation has been made in preclinical studies with lungs infected with respiratory syncytial virus (RSV), and treatment with an Axl monoclonal antibody inhibited the formation of fibrosis. Inhibition of Axl also appears to prevent the production of ECM by fibroblasts. A paper in press (published online) by Espindola et al in the American Journal of Respiratory and Critical Care Medicine (AJRCCM) provides evidence detailing the ability of bemcentinib to inhibit the production of ECM, migration and proliferation of fibroblasts in an IPF model. Data from various studies, consistent with Axl playing an important role in fibrosis, also suggests that Axl could be a valuable biomarker in diagnosing the disease. Espindola et al discovered that high levels of Axl expression was associated with patients with rapidly progressing IPF. Similarly, it has been suggested that soluble Axl can accurately detect advanced liver fibrosis and cirrhosis. The progression of fibrosis varies between different tissues and so the role of Axl might not always be the same. For example, Axl signalling appears to modulate the inflammatory response in IPF, but Tutusaus et al reported that Axl inhibition did not affect the immune response in the liver fibrosis model. That said, preclinical data indicates that Axl inhibition with bemcentinib or an Axl monoclonal antibody (such as BGB149) can reduce fibrosis in the liver, IPF and chronic kidney disease (CKD). So, targeting the Axl receptor could be an effective treatment for fibrosis in many if not all tissues. BerGenBio is yet to indicate what plans it has in fibrosis. That said, the company is in the fortunate position that it could develop either the specific, oral Axl inhibitor, bemcentinib. or the Axl monoclonal antibody, BGB149, for fibrosis. Bemcentinib is currently in development in Phase II development in various oncology indications, and a Phase I study in healthy volunteers has already been completed (safe and well tolerated up to 1.5g per day), so it is ready to be studied in a Phase Ib/II trial in a fibrotic indication. BGB149 is still in preclinical development and could be ready to be tested in healthy volunteers in a Phase I study in 2019. The advantage of developing bemcentinib in fibrosis is that it could potentially reach the market in this therapeutic area two years sooner than BGB149. In contrast, biologic products tend to be associated with better medication adherence than oral drugs in chronic indications, so BGB149 might be better suited as a product to treat chronic fibrotic indications. Also, there could be greater pricing flexibility with BGB149, if it is only developed in fibrosis, than for bemcentinib. Of course, BerGenBio could adopt a hybrid strategy; for example, it might develop bemcentinib in IPF (where pricing would be comparable to that in oncology) and BGB149 being developed for liver and renal fibrosis, which the more common. Both bemcentinib and BGB149 have blockbuster potential in each of the three fibrosis indications mentioned above. Boehringer Ingelheim’s nantedanib is set to achieve annual sales of over $1bn in FY18 in only its third year on the market, despite the limitations of the product as a treatment of IPF. 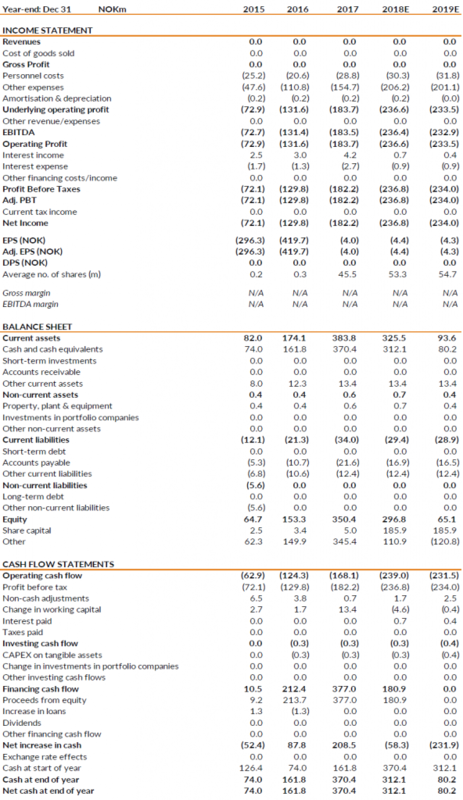 We are increasing our valuation by NOK361m to NOK2,880m ($339m, NOK52.65 per share) to take into account the NOK187.5m capital raise and adjusting discount factors for the progression of time. 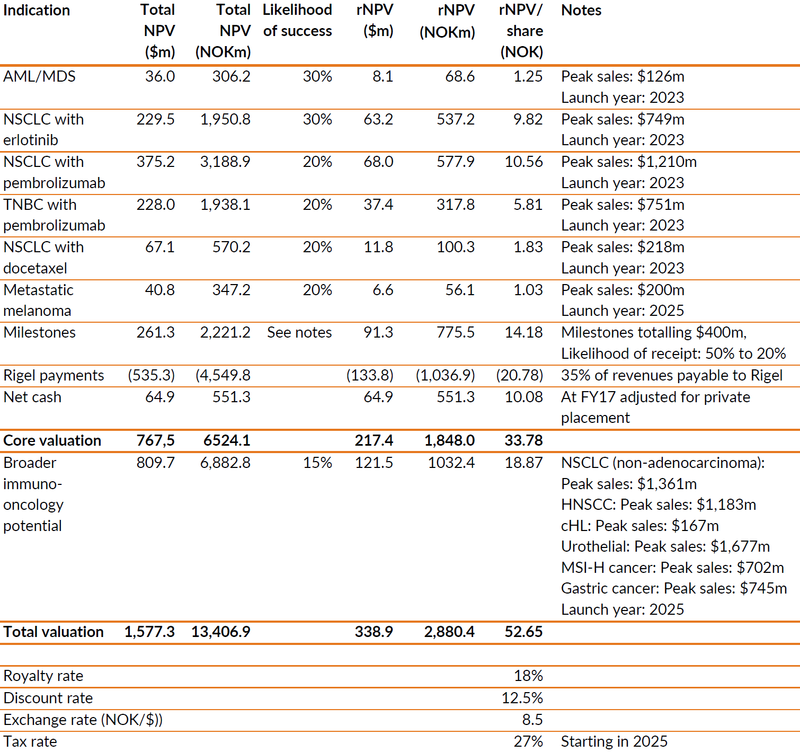 Our valuation is based on a core valuation of NOK1,848m, based on bemcentinib’s current clinical programme and an additional NOK1,032m to recognise the compound’s potential in other immuno-oncology indications, as summarised in Exhibit 2. In line with our conservative approach to valuation, we are not including the potential of treating fibrosis with bemcentinib or BGB149 until the company has disclosed its development plans. That said, we would expect the inclusion of fibrosis to have a material impact on our valuation, given the sizes of the markets for the different indications in fibrosis and the limited treatment options currently available. Several major catalysts for the shares are expected in the coming month. Clinical data from all six oncology Phase II studies with bemcentinib (see Initiation note), including the first efficacy data in immuno-oncology settings with Merck’s pembrolizumab (Keytruda), will probably be presented at the ASCO conference on 1-5 June. It should also be noted that the short-term funding overhang has been removed from BerGenBio’s shares by the private placement at NOK40.50/share, which raised a gross amount of NOK187.5m ($24m). We have made only minor changes to our estimates to take into account the capital raise, as detailed in Exhibit 3.